● Kyle Busch finished seventh in Sunday afternoon’s Advance Auto Parts Clash at Daytona. ● Busch started the 75-lap exhibition race in 13th, but was quickly able to move up through the field to fifth by lap 30. ● The race went caution free for 37 laps with much of the field single file line until the closing lap. ● The M&M’S driver found himself in fifth-place as the field headed to turn three on the final lap when Kyle Larson and Jimmie Johnson made contact directly in front of him. 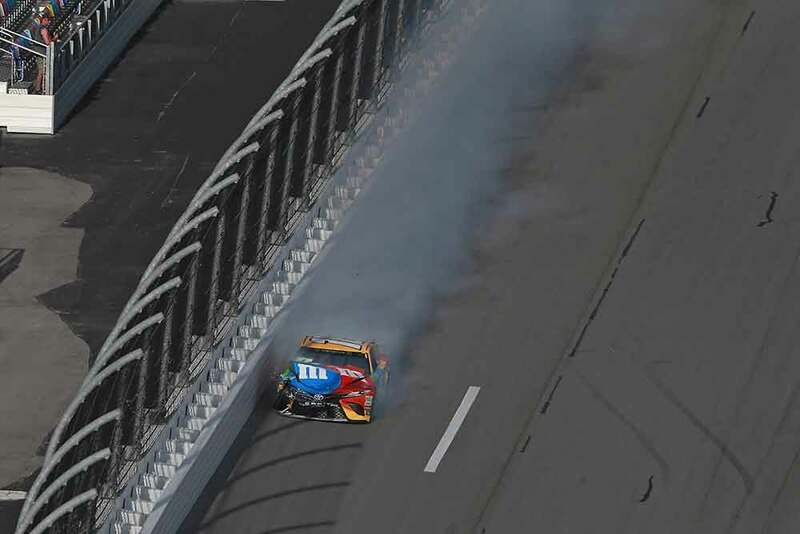 ● Busch couldn’t get out of the way in time of Johnson ahead of him and made contact. From there, all Busch could do was drive his battered car across the start/finish line for a seventh-place finish. ● Denny Hamlin, driver of the No. 11 Toyota, finished sixth. ● Erik Jones, driver of the No. 20 Toyota, finished eighth. Next Up: The Can-Am Duel – twin 150-mile races which will set the rest of the Daytona 500 field –will take place at 7 p.m. on Thursday, Feb. 15 with live coverage on FS1. Speedweeks at Daytona then culminates with the Daytona 500 at 2:30 p.m. on Sunday, Feb. 18, with live coverage provided by FOX.